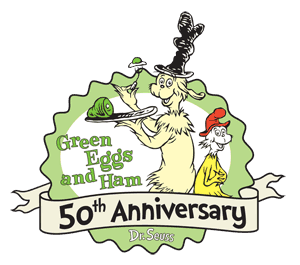 Hey guys ‘n gals – it’s Green Eggs and Ham 50th Anniversary this year and to celebrate, rock stars Melissa d’Arabian, Michael Symon, Mitzi Dulan and I created some fun recipes using…you guessed it…green eggs and ham. Together, we’re on the consumer advisory council for the Pork Board. I’ll tell you what though, my toughest cooking challenge ever was making green eggs look appetizing! My first experiment with green food coloring in the eggs resulted in a gnarly concoction that looked more like something out of a Dr. Seuss book. 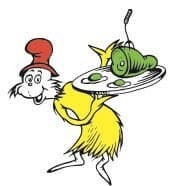 Okay, so Dr. Seuss books aren’t great for appetite and I’m suspiciously eyeing that Green Eggs and Ham Cookbook. 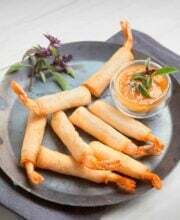 I wanted to create food that wasn’t just for show and tell but a dish that was actually appetizingt o both little kids and big kids. 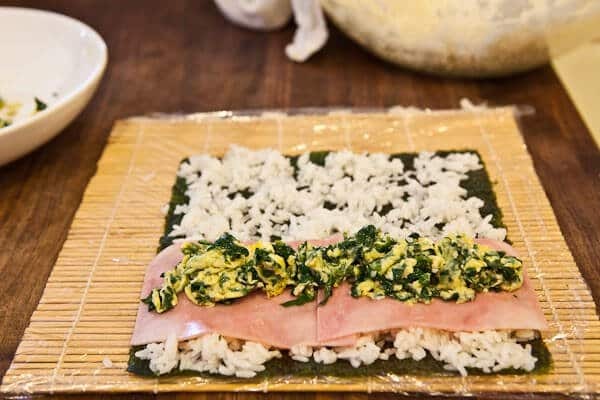 So, Green Eggs and Ham Sushi was born (hat tip to American Style Sushi Cookbook). The eggs are mixed with chopped spinach, lots of chopped spinach. 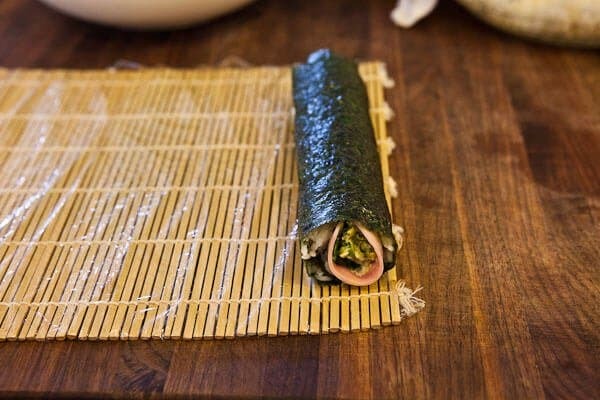 Below are step by step photos on how to roll the sushi – please try it with your kids! They’ll have a blast making sushi with you! oooh and before you go…can I humor you with An Ode to Spam in the Style of Seuss? 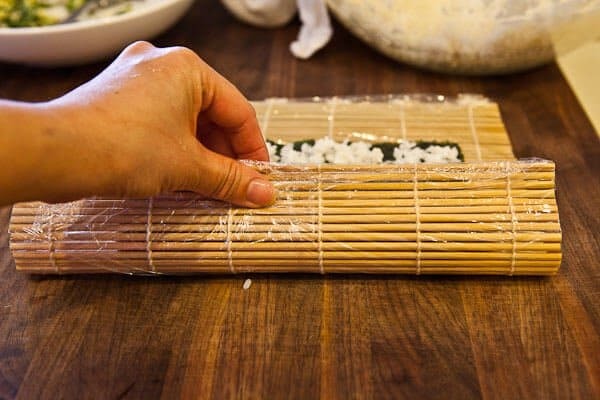 Make the sushi rice : Place rice in fine-mesh colander and rinse well to remove excess starch; drain. Transfer to a 2 1/2- to 3-quart heavy saucepan. Add water. Cover with tight fitting lid and bring to boil. Reduce heat to low or medium-low. Very gently simmer, covered, about 20 minutes or until water is absorbed. Remove from heat. Let stand, covered, for 15 minutes. 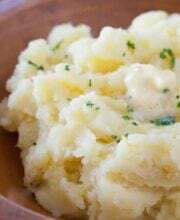 Transfer rice to a large baking dish or large bowl. Slightly cool. 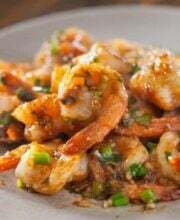 Sprinkle with rice vinegar; very gently toss until combined. Cool to room temperature. Cover with damp towel to prevent rice from drying out. 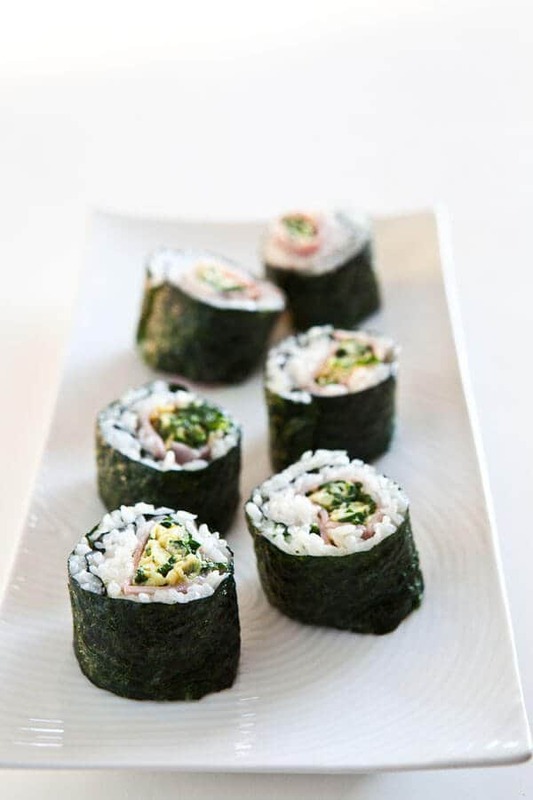 When making sushi, you want the rice to be close to room temperature (hot, steaming rice will make the seaweed soggy). 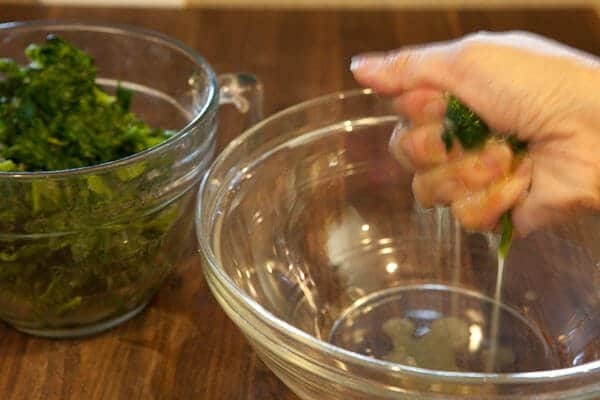 Meanwhile, for the spinach-egg filling, squeeze as much water out of the spinach as possible. Finely chop the spinach. Gently fry the eggs with the spinach and season with salt. Let cool before rolling sushi. 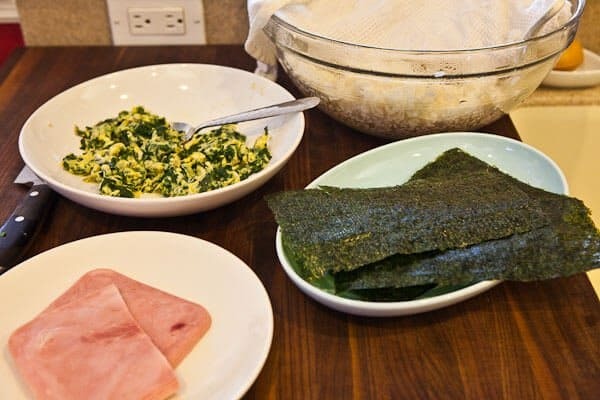 To roll the sushi, have all your ingredients ready. 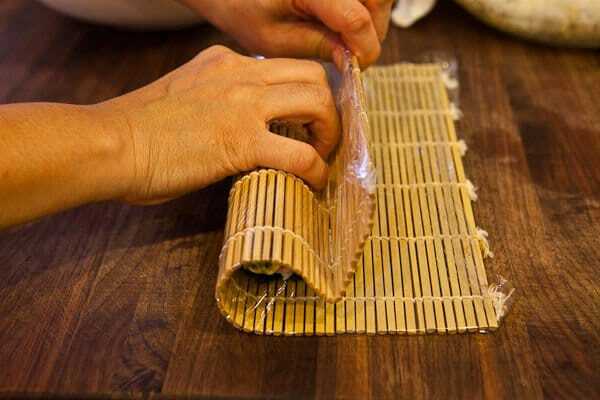 Lay out the sushi mat, with the bamboo running horizontally. 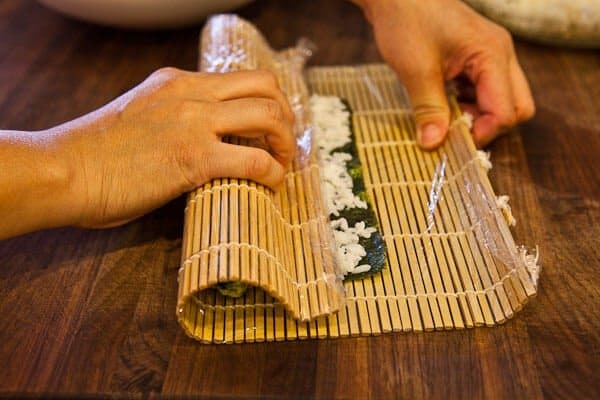 The sushi mat should be completely wrapped in plastic wrap (otherwise the rice will stick to it). 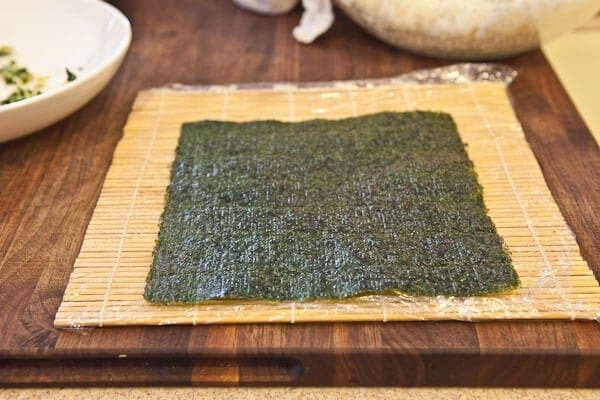 Lay the nori on the mat. Wet your hands, fling off excess water and grab about 3/4 cup of the sushi rice. Damp hands will prevent the rice from sticking. 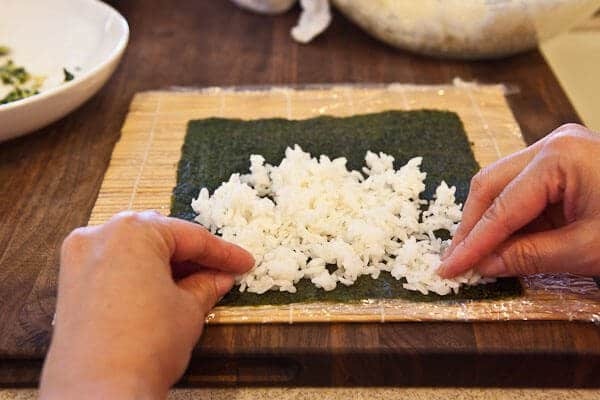 Use your fingertips and gently spread out the rice all over the seaweed. You don't want too much rice - just enough to barely cover. Spoon about 3 tablespoons of the egg/spinach mixture. 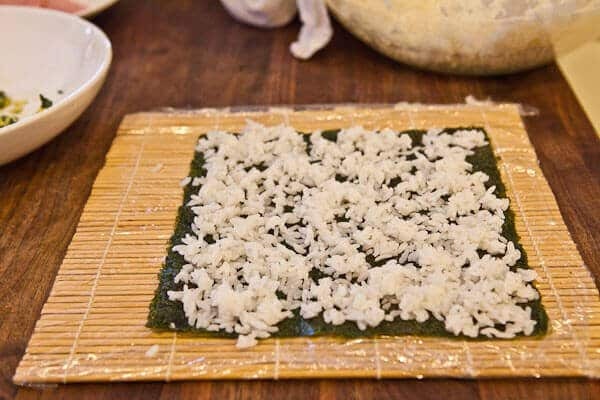 Move the nori so it is flush with the bottom of the mat. Now bring up the edge of the mat. 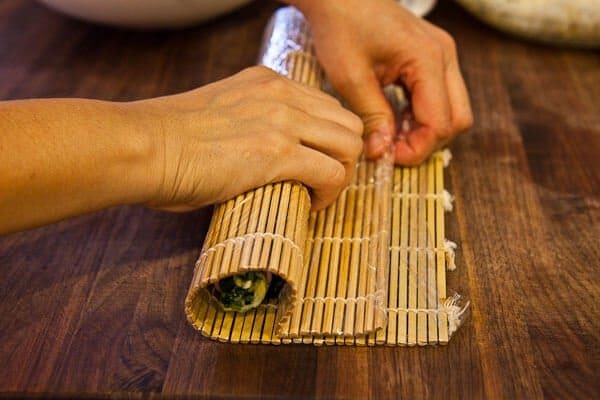 Begin rolling - but keep the edge of the bamboo mat up on top of the rice. Roll with one hand, and use the other hand to gently tug the mat. This will ensure a tight roll. See how I keep the edge of the bamboo mat up? 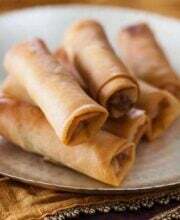 Continue rolling and gently tugging until roll is complete. Give it nice final tug back to tighten roll. There you go. See how even the roll is? Dip the tip your knife in water, and slice into 6 even pieces. A wet knife tip will prevent sticking. You can buy the sushi rice ready to use, right out of the package at WAL-MART…. IT’S aweSome…very inexpensive…….. Very delicious.. I like it.. Keep it up to post some recipes.. 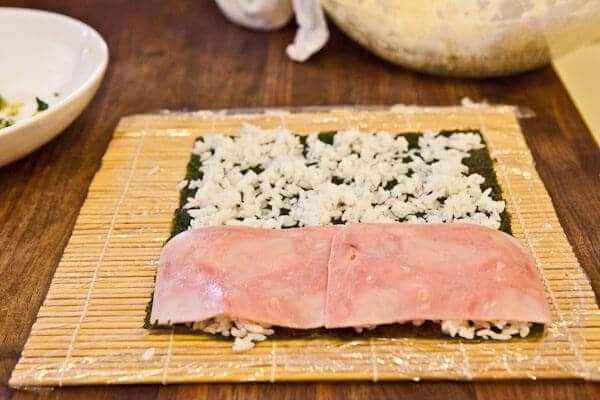 I must admit I was jumping when I found this posts… Sushi is one my favorite Chinese foods and I have been wondering how to make because I realized it is better to make homemade sushi that going in a very expensive and crowded restaurants. I am surprised it is that easy to prepare sushi. I have to try it immediately. I am so excited. This is an incredibly comprehensive recipe. The pictures also help a lot. Thanks for sharing. I love it. Well done on making green eggs and ham look appetizing! That is not an easy task. Sooo cute and so yummy-looking! I’m so excited about this! Thank you!!! What a great idea. Will definitely have to try this on my picky eaters! I have a 5 year old who reads (recites from memory) this book EVERY night. 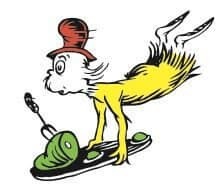 He would be thrilled to have green eggs and ham sushi! Wow, u made my 4yr old eat spinach and ask for MORE….. Super tasty. I used roasted turkey in place of ham. Great idea! I tried something similar to this when I got my first makimono lesson from a relative. I love bacon n eggs, so in lieu of ham, I used a couple strips of salty crispy bacon, then fried an egg paper flat so I got this yellow spiral after cutting. This was all done ad lib – and it was probably the ugliest looking makimono I ever saw. Taste-wise it really was only the sum of its parts: the salty bacon was battling the nori for dominance in flavor and the egg was hardly noticeable. I shoulda just thrown some seaweed shavings over a bacon-egg rice bowl! I’ll try your recipe out next time! oooh love the yellow spiral idea. I bet the bacon would go really well with some salty tobiko in sushi roll. 12 years ago!? Oh my, we’ll have to fix that….was it the raw fish that you didn’t like? Try mixing pesto in with the eggs before cooking. We had this in Sydney, Australia – just the ticket after a 14 hour flight. Yum. Jaden, that’s inspired. Love it! Interesting! Thanks for the step by step too – I have yet to make sushi of any kind at home because I chicken out. Bet kids would especially love this one! LOL I bet she’ll enjoy making the sushi. yum! 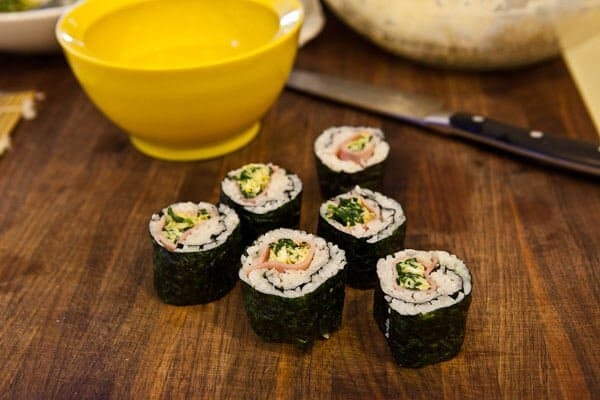 now i want to make myself some sushi maki this weekend. 🙂 thanks for sharing! Michael Symon??? YEAH, baby! 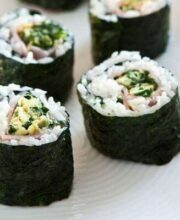 Shane and Lauren might even venture away from their Cucumber rolls to try this one! They are very experimental! NOT! ooooh! eggs and ham cookbook??? that will be on my top 10 Christmas list! dr. seuss is one of my childhood favorites, along with charles schulz.